Lo mejor ... Don linos place es sencillamente un lugar genial y super bien atendido por su amable e inolvidable dueña.....gran precio, y atención. 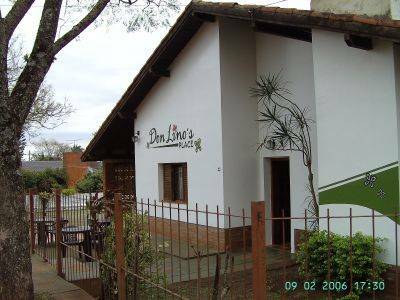 Don Linos Place is a hostel which invites you to share our facilities in a warm and friendly way. Don Linos Place, is located a few kilometres from the Natural Patrimony of the Humanity, The Iguazu Falls, the perfect tourist place during the whole year, where the sounds of nature gives the traveller a unique and unforgettable show. Get Ready To Enjoy It! Unique place in the world where two big rivers, PARANA and IGUAZU, make a border of friendship between three countries of Latin America: Argentina, Brazil and Paraguay. You can appreciate it by visiting the Three Frontiers Landmark. The climate is subtropical, warm and humid with luxuriant flora and fauna. You will have many options of adventure tourism, nautical trips, day and night, international level malls, great hotel and communication infrastructure as well as excellent restaurants. Come and discover the secrets of the jungle and the people and feel the magic emotions of the falls! We await for you to come and discover the secrets of the jungle and its people. 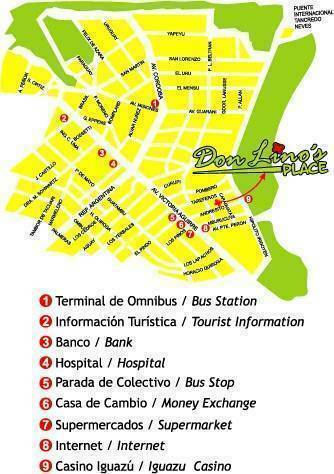 Located near the currency exchange house, supermarkets and the Iguazu Casino. 5 minutes from the international bridge to Brazil. 15 minutes from the Iguazu waterfalls. 2 blocks from the principal avenue Victoria Aguirre. 2 bocks from the bus stop for local buses, buses to the Iguazu falls, and the international buses to Paraguay and Brazil. 6 blocks from downtown Puerto Iguazu. 7 blocks from the Bus Terminal. 2 mixed Dorm of 3 people with ceiling ventilator, shared bath, bed linen, lockers and breakfast including. 1 room-dorm of 8 people (male) with ceiling ventilator, shared bath, bed linen, lockers and breakfast including. 1 room of 8 people (female) with ceiling ventilator, shared bath, bed linen, lockers and breakfast including.